In 2002 the CIA employed an armed drone in a targeted killing in Afghanistan and since then they have been used thousands of times. To their advocates they are a way of defeating a dangerous enemy without risking the lives of troops; to their critics they are a cowardly form of remote control killing which make murder more acceptable by putting distance between the target and the trigger puller. Contesting for last year’s Golden Lion prize at the Venice Film Festival, director Andrew Niccol’s Good Kill (2014) – starring man of the moment Ethan Hawke – is a timely intervention in the debate that though occasionally devastating is all too often found off-target. Hawke plays Major Tommy Egan, a pilot reassigned from flying jets in the combat zone to a Las Vegas suburb where he spends his shifts directing drone strikes 3,000 miles away. He returns home to his ex-dancer wife Molly (January Jones) and his poppet kids. Ice cool in his demeanour, when asked if her quiet husband gets angry and what it looks like she replies, “He goes quieter.” However, underneath the implacable exterior Tommy is beginning to have doubts. He feels himself to be a sham and desperately wants to fly again, even if it means returning to a combat zone and the danger that goes with it. Wearing his Top Gun outfit, the liquor store clerk thinks he’s some sort of a cosplay fantasist. Although in his commanding officer Lt. Colonel Johns (played by a flinty Bruce Greenwood), Tommy has a sympathetic boss, not shy of questioning the wisdom of what they are doing, when the command switches to the CIA in Langley and the softness of the targets becomes increasingly obvious, Tommy begins to lose faith in his mission. Niccol populates his films with alienated individuals living in alternate realities. From Truman in his reality show suburbia and Hawke’s genetic imposter in 1997’s Gattaca to the class warfare of the middling In Time (2012), Niccol’s imagined nightmares grasp for an allegorical potency. With Good Kill, the alienation and the out of joint reality are not some far-fetched science fiction idea, but are ripped from the headlines. His latest effort is at its strongest in the control room, recounting the kills. The language, with its formal repetition and the various laconic jokes by the more gung-ho in the room, recall the infamous video tapes of the attack helicopters killing Reuters journalists in Baghdad. However, when the film leaves the ‘field of battle’ so to speak and it seems to be killing time. Tommy’s domestic troubles are wearyingly familiar and his resolution of them or otherwise seems trivial compared to the murder he’s committing on a daily basis. 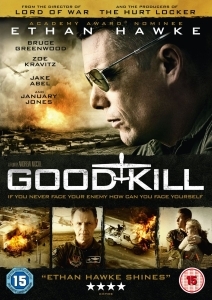 New recruit Suarez (Zoë Kravitz) is the conscience of the film, nicknamed Jane Fonda for her pains, a voice from Langley (Peter Coyote) is essentially the ghost of Donald Rumsfeld and Captain Zimmer (Jake Abel) is the Fox News-style advocate of lethal force. The commanding officer Johns swings from weary cynicism to patriotic fervour more at the behest of plot exigency than because this is what the character would credibly say. The sheer amount of debate seems highly unlikely as well. Hawke – in gravelly military mode – does his best to put some tense humanity into his role, but the twists and turns of his character feel arbitrary and though Tommy longs for a hero role, the film in trying to give him a moment ends up misfiring. When Good Kill takes aim at US foreign policy and the advances in military technology it creates moments of chilling and powerful drama, but this is dissipated and compromised by its mirror-punching domestic drama and its bizarre need to bring about something like a happy ending.